Can you order tap water for free stickers? When does McDonald's Monopoly begin? 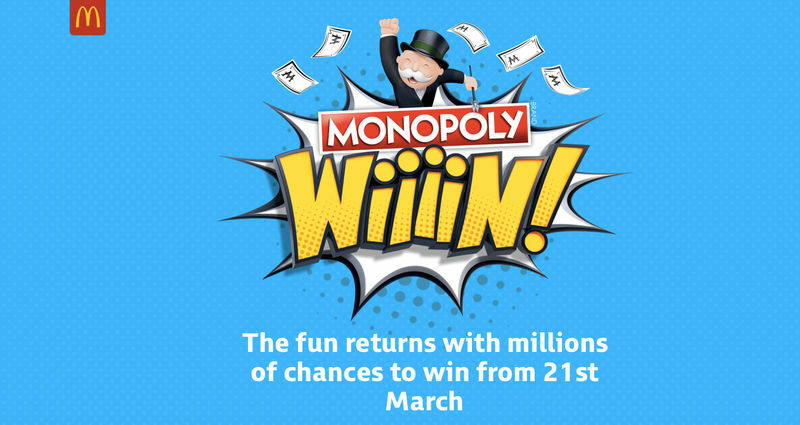 McDonald's Monopoly begins 21st March 2018. The restaurant chain teased fans by posting this picture on the 15th February, but held off until last week before releasing the official start date. This came just before they announced the introduction of two new Big Mac sizes, as a celebration of their 50th anniversary. Last year, the games began on Wednesday 22nd March, and fans had until midnight on Tuesday 2nd May to collect stickers to win prizes. Some of the amazing prices on offer last year included tech products like iPads, £100,000, and over 45 million food and drink instant prizes. Last year you could also trade in spare stickers for a NOW TV pass on a month’s trial. Prizes for this year have yet to be revealed, but hopefully McDonald’s will release them soon. With the game starting soon, Latest Deals have found the best tips and tricks to help you win, and debunked fake rumours about how to get more stickers. In 2017, medium sized products got two stickers each, and large items gave you three stickers. So sizing up your meal will get you more stickers, and a better chance of winning. These might not seem like exciting prizes, but saving them is actually one of the best ways to win a cash prize of £5-£100. Every minute, there are two cash prizes to be won by whoever enters the codes at the right time, so it’s just a game of chance. If you’re using your game codes, think about the timing of when you enter them. Lunch time will be more popular for entering the codes, meaning your odds of winning will decrease, but if you enter them at ‘off-peak’ times, like late at night, then you’ll have a better chance of winning. You can always check other people’s discarded stickers for prices. Many people will still go to McDonald’s during monopoly time and not take part, leaving their stickers. You can take advantage of this by checking them to see if there’s anything good on them, like an instant win, or a sticker that will complete your property set. Not only is this a way to save money on McDonald’s, but you’ll get the same amount of stickers for less money. You can get free McDonald’s vouchers in some newspapers, like the Metro, and on the back of bus tickets, and these can be a great way to spend less on your Monopoly hunt. However, the meals you get on vouchers are usually the ones where you won’t get any stickers on your burger, but you can still take part with the fries. So you’re saving money, getting tasty food, and entering the competition. Get your friends and family to play along as well. They’ll be able to win prizes, and you can swap tickets with each other to help complete sets quicker. You can also join Facebook Groups for Monopoly sticker swapping. This is a trick that people often talk about. It has been claimed that if you order a cup of tap water, it comes in a cup with stickers down the side, which would mean you’d get more stickers for free. This would be a great way to get more stickers- but sadly it is false! During the McDonald’s Monopoly period, they give out tap water in plain cups, so no extra stickers when you do this. What are your best tips for winning? Let us know in the comments!